Located at just 4 KM away from the Baratang Jetty and about 100 Km from the city of Port Blair is the one of its kind in the whole India- Live Mud Volcano. This mud volcano is one more main attraction for visitors travelling in Andaman islands. Though this Volcano is nature’s wonder. It takes atleast a day to visit this place and return to Port Blair. People have to travel through road in a Jarwan tribal reserve (forest area) and cross the sea at Baratang jetty. After crossing the sea people reach the Uttara Jetty . From Uttara Jetty this place is 20 minutes journey by road. 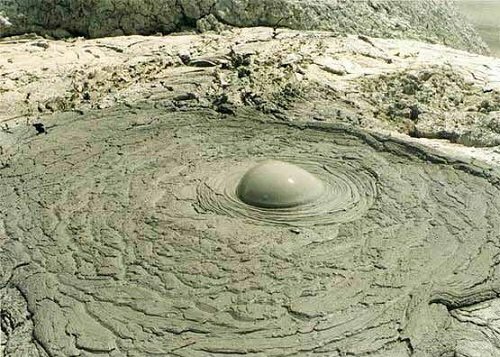 These mud volcanoes have erupted sporadically, with recent eruptions in 2005 believed to have been associated with the 2004 Indian Ocean earthquake. The previous major eruption recorded was on 18 February 2003. The locals call this mud volcano jalki. Mud Volcano is created by natural gases emitted by decaying organic matter underground. As the mud is pushed upwards by the gas, it deposits and hardens above ground. As more mud oozes out and spills over the edge it grows in sizes, gradually forming what you can see today a miniature volcano with rich, creamy mud crater at the top. Ghummo Andaman in its Standard Packages include an exclusive trip to this Natural Wonder –The Mud Volcano..!! !